Yearbook filled to the brim with notes and phone numbers from my friends—check. Final report card stashed in my backpack (which I may or may not show my parents right away when I get home)—check. All that was left now was to watch that classroom clock count down the final minutes before summer vacation officially began. When you’re a kid, summer vacation ushers in a season for cartoons, ice cream cones, and water fights with the hose. “No more pencils, no more books! No more teachers…” well, you know the rest. Okay, back to reality. You know that your students’ last day of school is hardly your first day of vacation. When that final bell rings, your summer work begins. There will be teacher meetings, professional development workshops, hiring committees and interviews for the upcoming year, campus maintenance and improvements – the list goes on. While we sincerely hope you get at least a little time for some R&R this summer, we also hope you maintain the strong communication habits you’ve worked so hard to build over the course of the year. 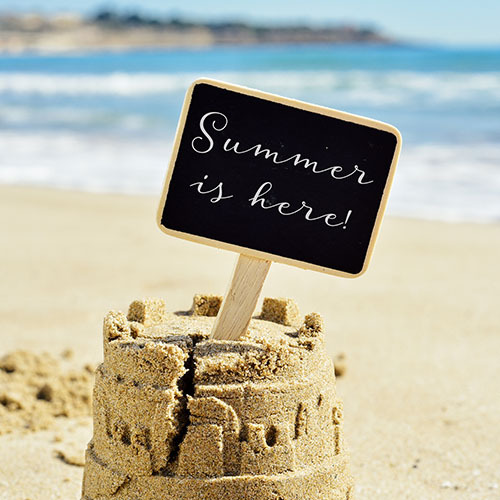 While your students’ parents will also be ready for a break from school, they’ll still want to stay connected over the summer so they aren’t in a panic trying to scrape for information come fall. More importantly, you won’t have to work quite as hard to re-establish good communication channels between home and school if you keep those relationships going over the summer. There are several things you can do to stay in touch, and your school’s website and social media pages, working hand-in-hand, as they always should, are the perfect places to do it. Home Page Message: Does your Home page still welcome students back from winter break? Does your site’s greeting from the principal or superintendent still refer to construction updates for completed projects or upcoming parent-teacher conferences that actually took place back in September? Now’s the time to draft a new message. When you write it, consider how well it stands the test of time. Home page messages that refer to specific events need updating much more often. Otherwise, a new message each quarter or semester gives site visitors a fresh picture of your school and an ever-involved administration. School Calendar: Does your calendar contain future events? Does it include early release days, school assemblies, and concerts? We know there’s a lot going on at your school. Would visitors to your website get an accurate impression of how active your student body is? If your Web calendar is interactive but doesn’t have any dates entered, the time-saving tool you’re promising your community is just going to waste. We know you have a calendar for the upcoming school year, so publish it! News Page: Your school website’s News page is all about sharing the stories that make your school stand out from the rest. Telling your school’s stories shouldn’t be placed on hold all summer; instead, use this time to show that you are an active member of the community even when school’s not in session. Remember, some parents still haven’t decided what school they’ll send their child to in the fall. When they come across your website, you want to them to remember their visit. Share summer-related links, articles, and community events. Direct visitors to your social media pages, drawing their attention to any fun summertime social media campaigns you may be running there. Share some of your goals for the upcoming academic year. Facebook mobile sharing and consumption grew by 26% between the months of May and September. Of those posts, video content increased by 43%. More than likely, your community is using social media even more regularly during summer months to connect with family and friends, share fun summer photos, and get vacation ideas. Many people are also shopping online over the summer, and social media plays a role in their purchase decisions. If you consider families who may be looking to start at a new school come August/September, this becomes especially relevant for you! With more people using social media more often over the break, traffic is high, increasing the chances that your posts are being seen by a wider audience than normal—especially if your content is good enough to share. Over the summer, it becomes especially important to keep your social media posts audience-centered. Rather than telling them things you want them to remember over the break, like asking them to make sure their child is reading or studying for their return to school, try instead to focus on what will catch your followers’ interest as they browse their home feeds. You can make these topics work for your school community, too! For example, let’s say you want to talk movies. Common Sense Media often shares top picks and movie reviews for families that you can use on your own social pages. Or take a movie title and run with it! Do a Twitter poll to see who liked the most recent box office release. Turn it into a contest and ask followers to submit in a silly family selfie from your local movie theater and offer movie tickets to the winning family. The possibilities are endless. One of the ways you can keep your community engaged with your school over summer break is to run a fun school social media campaign. An effective social media campaign keeps your current followers interested and may even perk the interest of a few prospective parents. Conducting a school social media campaign means actively starting conversations online, pushing content, driving traffic to your website, and expanding visibility. It basically amounts to inviting your followers to play a game with you as a way to encourage interaction with your school brand. They’ll play because it’s fun and because you’ll offer special recognition or prizes, and your school’s reward is extra exposure. Everyone wins. Your mission? Pick a contest, and have fun with it! Student/Family Facebook Cover Photo: Invite families to take a creative picture that communicates their school pride, even while they’re on vacation. When they submit their photos, let it spend a week serving as your school’s cover photo. Photo/Video Contest: Invite families to submit a “what we did on our summer vacation” photo. Put it to a vote or just select a favorite to win. Like to Enter: Post a photo of your staff enjoying their summer break and invite followers to like it over a certain period of time. Enter those names in a drawing and offer a prize to the winner. Share to Enter: Post a creative video featuring your school staff and invite followers to share it with their friends over a certain time period, entering those who do into a raffle. Pin It to Win It: On your Pinterest page, enter the names into a raffle of those who re-pin your summer pins over a certain time period. If you want your followers to engage with your summertime posts and share them with friends and family, expanding your audience even further, be sure you focus on them and make it fun. These posts will go a long way toward making you and your staff more approachable and likeable, putting you on an even playing field with your parent community. It’s the perfect opportunity to take a break from strictly education-centered content, and hone in on the things that make this time of year special for you and your community. Summer vacation provides everyone with at least a little time of reprieve and even though we know you have a list of work-related items to check off before heading back into the classroom in the fall, don’t take a vacation from your communication. Staying in contact with your school community doesn’t have to take away from your chance to take a break this summer—it could (and should) be fun! You’ve worked hard all year long to build up a strong relationship with school families; if you want that relationship to remain strong, you have to nurture it. Keep your school on your community’s radar by sharing some lighter, summer-related topics early on, and then move into the more important information about the new school year as vacation comes to a close and parents feel ready to start gearing up for the new school year. With the right amount of communication this summer, you’ll transition back in the fall without missing a beat.